Now that you have chosen the highest quality pine floor, here are the top quality accessories you may want to properly install and finish your floor. All our pine flooring accessories were hand picked and tested by Bjarki, the owner of The Wood Mill. These are tried and trusted nails, finishes, and installation accessories that can be used with confidence to properly install your wide pine floors. Please read our full installation guide, ask your flooring installer, or call us with any questions. Click here to download our installation guide. For over 100 years Waterlox Coatings has been the nation’s leading manufacturer of premium wood finishes, handmade from natural resin-modified tung oil. Waterlox continues to manufacture wood finishes using the finest ingredients, combining tung oil, resins, mineral spirits and other ingredients to produce a complete wood finish that gives the look and feel of naturally oiled wood. Waterlox products represent the flooring industry’s highest level of quality protection. For the most part, the company still makes its hand-made wood finishes the exact same way it did over 100 years ago. Beauty – Waterlox provides a rich, hand-rubbed patina that enhances the white pine grain and brings out its inherent beauty. Waterlox finishes penetrate deep into the pores of the pine forming a bond from within. Waterlox is Bjarki’s first choice of tung oils, and has been used by many satisfied customers with excellent results. Durability – Waterlox tung oil finish is the perfect alternative to polyurethane finishes to preserve pine while revealing its gorgeous color and grain pattern. 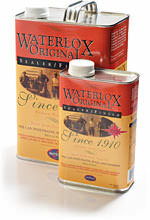 Waterlox literally locks out water with a formula that relies on the protective nature of resins and the penetrating sealing advantages of tung oil. Unlike a polyurethane which sits on top of the wood, Waterlox permeates wood surfaces and actually becomes part of the wood itself to resist moisture, dirt, household chemicals, alchoholic beverages, etc to provide an excellent finish. Because tung oil soaks into the wood, rather than sitting on the wood the resulting finish is softer than than polyurethane. This will allow your floor to show more wear, creating the rustic old school pine look many home owners desire. A floor showing surface wear in no way effects the floors durability. Ease of use – Waterlox finishes are surprisingly easy to apply. They have a longer “open time” meaning they stay workable for a greater period of time than most waterborne or oil based urethane. Because Waterlox is self-leveling, lap marks, turns and cut-ins disappear. Waterlox is also simple to maintain. If noticeable scratches or wear appear on your pine floor, all you need to do is clean the damaged area well with soap and water and then reapply a new coat where needed. You do not need to sand down to bare wood or refinish the entire floor like you do with oil based polyurethane finishes. Waterlox is available as sealer/finish, satin finish, or a high gloss finish, each providing different but beautiful results. For our pine flooring we recommend 4 coats to be applied total. Always start with 3 coats of the sealer/finish, then top the floor off with your choice of a final coat of sealer/finish for medium sheen, satin finish for low sheen, or high gloss for a bright sheen. For full information the different options please call us. Don’t forget to ask about VOC compliant vs. original formula, depending on what state you are in. 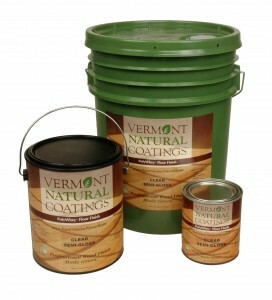 Vermont Natural Coatings patented PolyWhey® technology has emerged as a new category of wood finish; delivering easy-to-use products that have established the highest performance and environmental standards. They use whey protein, a byproduct of cheese making, to displace toxic ingredients found in traditional finishes. Vermont Natural Coatings PolyWhey floor and furniture finishes are a top choice of professionals and do-it-yourselfers alike. The production of oil-based wood finishes and other coatings, such as paint, have relied solely on petroleum, a non-renewable resource. PolyWhey is derived from a renewable resource and in a small way helps to reduce dependence on oil, contributing to a more sustainable world. Click here to watch a video about how they do it. Vermont Natural Coatings PolyWhey floor finish is our #1 recommendation for a polyurethane finish. It is water based, and forms a much harder finish than traditional polyurethanes. It is non-yellowing which makes it easy to repair in high traffic areas. It is incredibly easy to apply, fast drying (under 2 hours per coat), non-toxic, and has a pleasant neutral odor! Each gallon covers 500 to 600 square feet and we recommend 3 coats on our Pine flooring. This finish options comes in Matte, Satin, or Semi-Gloss. Since the early 1800’s, Tremont Nails have been providing top quality historically authentic cut nails. These nails are still manufactured in the original Massachusetts factory, using the same traditional methods of last century. Many of the machines are over 125 years old, and when it comes to nails, it really can’t get any more authentic than that. Cut nails provide your floors with a distinguished look, turning your wide pine floor into a real conversation piece… in case the 20″ wide planks were not enough already! Besides the historically accurate look, cut nails provide superior holding power over wire nails because of the four edged design. Cut nails wedge into the wood pushing and compressing the wood fibers downward rather than splitting the fibers as wire nails do. This minimizes surface splitting of the wood. Tremont offers many styles of nails for all sorts of wood working projects, we have chosen the following four as the best options for wide pine floors. If cut nails will be used as the primary holder, we recommend using a 8D 2.5″ and driving the nails into each floor joists. When cut nails are used as the secondary holder for aesthetics, such as when being combined with blind nailing a 2″ nail will suffice. Popular nails for face-nailing pine or softwood floors, framing, roughing in, and scaffolding. Also used for cabinet work, interior and exterior siding, furniture repair, batten doors and paneling. Available in standard and hot-dip galvanized. These button-head nails are malleable enough to be clinched if desired. Often used for face-nailing wide board flooring, furniture repair, cabinet work, interior walls, batten doors, paneling and counter tops. Available in standard, hot-dip galvanized or black oxide finish. Designed to simulate the hand forged nails of the late 1700’s, the head is three sided and the nail has a black oxide coating. Ideal for authentic restoration and antique effect. Uses include face-nailing flooring, rough sawn interior and exterior siding, batten doors, paneling, counter tops and cabinet work. Also available galvanized. Useful for face-nailing floors as well as framing, roughing, and paneling, and for sculpturing. Available in standard, hot-dip galvanized or black oxide finish. In the past these nails have been the most popular option for our pine floors. Talk to a Pine flooring expert!